You’ve arrived at your Walt Disney World hotel, dropped off your luggage, and you’re ready to head out to the theme parks! But wait, what do you need to take with you into the parks? 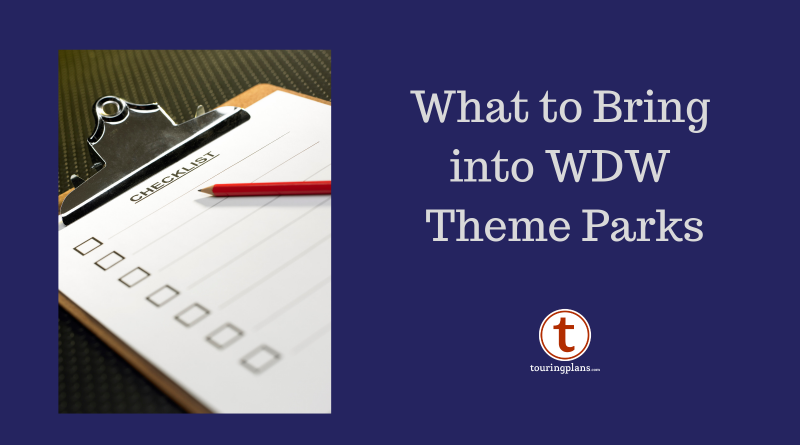 There are a variety of strategies for deciding what to bring into the parks. Some folks want to tote only the bare minimum that will fit in their pockets, while others want to be prepared with every item they might need in any eventuality. Where you fall on this spectrum may be influenced by your age, whether you have children in your party, how many times you’ve been to the parks, how long you plan to be in the park, what time of year it is, whether you’re planning to use a locker in the parks, and a variety of other factors. What a solo adult will bring into the parks for a 1-2 hour visit might be vastly different than what a family with toddlers will need for an 8-10 hour visit. 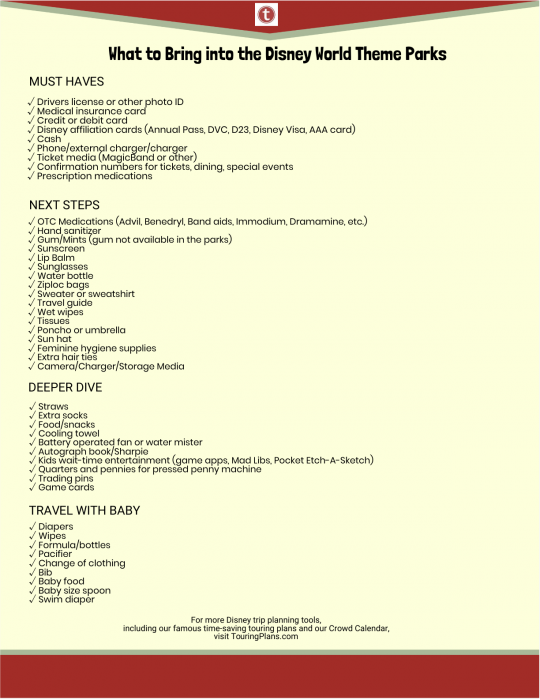 I’ll break daybag packing into must haves, next steps, deep dives, and travel with baby. Your personal needs will determine which version you choose. Here’s a Printable PDF of the Park Bag Packing List. MagicBands have incredible functionality. They can serve as your room key, park ticket, food and merchandise charging device, and more. If you’re using a MagicBand during your trip, bring it to the parks with you; if you’re not using a MagicBand, you’ll need your park admission ticket. The versatility of MagicBands leads some guests to believe they can go into the parks with nothing but the band, unencumbered by anything else. While it’s certainly possible that this could work, I strongly caution against it. Over the course of my many visits to Walt Disney World, there have been about half a dozen times where I’ve ended up leaving the park unexpectedly, mostly due to minor to moderate issues that resulted in a family member going directly from a park to a medical facility. While this is an unlikely circumstance, you should ALWAYS be prepared with enough identification and documentation to allow you to receive medical attention as quickly as possible. This means that you should have a photo ID, medical insurance card, and a payment card with you at all times. Even if you’re willing to risk it by not carrying your insurance card, there have been many times in my travels where technical glitches have made MagicBand payment wonky and using a credit card or cash has been necessary to make in-park purchases. Cash is also helpful if you end up off-property and need to tip someone or pay for something where plastic cards and MagicBands are not valid payment methods. The vast majority of adults (and teens and tweens) will bring their cellphone into the parks, if not for communication, then for photography and access to apps like My Disney Experience and Lines that help with navigating your park visit. Many guests report that heavy phone use in the parks takes a massive toll on their battery; an external charger can save the day. Also to remember to bring any Disney affiliation cards such as your annual pass, Disney Vacation Club card, Tables in Wonderland, and so on that may be useful in getting perks or discounts in the parks. Remember, if you have your annual pass loaded onto a MagicBand, that will get you into the park, but it’s not enough to get you a merchandise discount. For that you’ll need your physical pass card and a photo ID. I like to have a printout, or at least a screenshot, of my FastPass times and restaurant confirmation numbers in case the Disney website goes down or the park WiFi is spotty. And of course, you’ll want to bring any necessary prescription medications with you into the parks. The Next Steps are things that make your experience more comfortable, but are not 100% necessary. Most of the items in this section can be acquired in the parks if needed, but they’re small enough or light enough that bringing them yourself won’t slow you down. Weather-related items are at the top of most Next Step lists. Sunscreen is a must for nearly everyone, but if you’ve applied it in advance and won’t be at the parks long, you may be able to leave the bottle in the room. Other weather-related items to consider are sunglasses, sun hats, umbrellas or ponchos, sweaters, or similar items that protect you from the elements. Then consider physical comfort and minor medical issue remediation. This includes things like lip balm, hand sanitizer, a water bottle (much cheaper than buying water for $4.00 a bottle in the parks), tissues and/or wet wipes, gum or mints (gum is not available for purchase anywhere at WDW), and women may want extra hair ties or feminine hygiene supplies. I also like to bring a small pouch into the parks with a few bandaids and a dose or two of some basic over-the-counter medications like Advil, Benedryl, and Immodium. These are all available at the in-park first aid centers, but having ready access to them can be a sanity saver. Shoutout to one of my favorite niche websites, minium.biz that sells easy-to-carry, travel-size, and single-serve portions of just about every product imaginable. 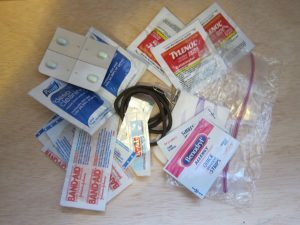 A typical “Next Steps” pouch of OTC meds and comfort items. Easily fits in a snack-size zip top bag. If you use a camera, rather than your phone, to capture memories be sure to bring it, along with any necessary paraphernalia such as extra batteries or memory cards. And if you’re old school, keeping your Unofficial Guide to Walt Disney World on hand can help you answer park planning questions on the fly. Another easy item to tote is a small Ziploc baggie. Use this to protect your phone on water rides, to keep souvenirs corralled, to save some uneaten snacks to enjoy later in the day, or for dozens of other purposes. Further down on the list of things to bring into the parks are the “Just For Fun” items like quarters and pennies to use in the pressed penny machines, autograph books and sharpies to use when meeting characters, trading pins and pin lanyard, cards related to Sorcerers of the Magic Kingdom or similar games, and wait-time entertainment for kids (or adults) such a puzzle books, Mad Libs, a small etch-a-sketch, or portable gadgets. Food is plentiful in the parks, but if you want to bring you own for allergy, preference, convenience, or budgetary reasons, feel free to do so. If you want more focus on comfort, bring extra socks (important if your feet get wet in a downpour), a cooling towel, or a small battery-operated fan or mister. And be aware that plastic straws are on their way to be phased out a Disney World, making them hard to find in some circumstances. If you’re a die-hard straw person (or need them for a medical reason), then bring your own, just in case. If you’re visiting with a small child, then traveling light is likely not an option. Baby gear you may need in the parks may include diapers, wipes, formula/bottles, baby food, baby-sized spoon, bib, pacifier, a change of clothing, swim diaper (for playing in fountains), and whatever other favorite products you need to get through the day. A small selection of these items is sold in the park Baby Care Centers, but plan to bring your own since they may not have your specific brand/variety preference. Let’s start off by saying that everyone heading into the theme parks is subject to a bag search before being allowed to enter the parks. If you’re carrying anything that’s not in your clothing pockets, you will be asked to visit the security tables. A guard will open your bag, unzip every zipper, and open all the sub-bags within your main bag. They don’t care about food or personal items; they’re looking for weapons and other contraband (see our post on what NOT to bring into the Disney World theme parks). Guests who are not carrying bags may be allowed to bypass the security tables, but they may still have to go through a metal detector (like at the airport) and place items such as cell phones and wallets in a bin for inspection. Even the smallest clutch will be searched, so just roll with it. If you’re only toting the Must Haves, then you might not need a bag at all. If you have a baby with you, you’ll probably need a large diaper bag. A photography enthusiast will want a padded camera bag. Beyond that, it’s really a matter of personal preference: purses, fanny packs, crossbody bags, and backpacks all have their fans. Think about the weather, how much you’re carrying, the weight of the bag and its contents, and whether you plan to add items such as merchandise purchases to the bag during the day. Be aware that you can bring bags with you onto the rides and consider how the size and shape of the bag might work for or against you when boarding attractions. What are your thoughts on packing for a day at the parks? Are our Deep Dives your Must Haves? Is there something we forget? What’s your favorite bag? Let us know in the comments below. How to Determine the Value of a Disney World Vacation Package?